Could You Be The Cause Of Your Thinning Hair? Could you be the reason your hair is thinning? Today I am going to answer a question that was emailed to me by someone whose hair was thinning. She is wanting to know if she could possibly be the reason her hair is thinning due to weave. Let's jump right in. 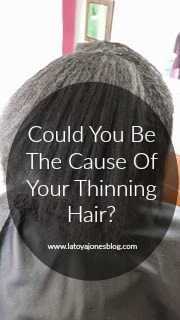 Question: Hi LaToya, I would like to know your recommendations for thinning hair, not necessarily from chemicals, but possibly from too much exposure to hair weaves. Is there a chance for regrowth? Let me start by saying that adding weave/extensions to your hair is not a bad thing to do. The method of installation chosen is what takes a lot of women's hair out. Most methods that do not involve glue are harmless to your hair (if done correctly), so I'm going to lean towards the idea that you are using a method involving glue. I am a firm believer that glue and hair DO NOT mix. 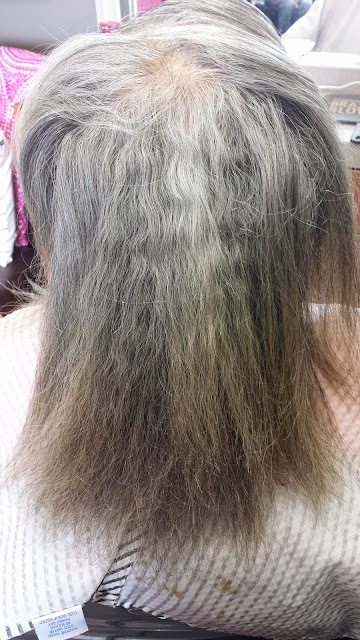 Constantly gluing tracks onto your hair, no matter what method is used (i.e fusion, bonding directly to the hair, quick weaves, etc), leads to alopecia. If you are using any of the mentioned methods of weaving your hair, stop immediately! This is the first step to recovering your hair. The longer you continue to use glue on your hair, the worse it becomes, shortening your chances of regrowth. My first suggestion would be to leave the weave alone for a while to allow your hair to be correctly treated. If your hair is so thin that it makes you uncomfortable to wear your own hair right now, opt for a wig, custom made if possible. This will allow you to treat your hair and also allow it to breathe when you take the wig off.